The MCCC baseball team at the 2017 NJCAA World Series in Enid, Okla. Starting pitcher Dennis Brady led the nation in ERA, and was second in wins and strikeouts. 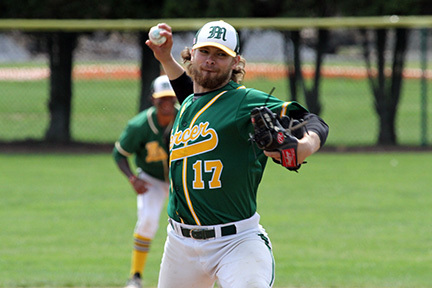 He was named Region 19 Pitcher of the Year and NJCAA World Series Pitcher of the Tournament. First baseman and designated hitter Sid Kumar was fourth in the nation in home runs (17) and fifth in slugging percentage (.842). He was named first team Region 19 and to the World Series All-Tournament team. WEST WINDSOR – It was a year of firsts for the Mercer County Community College (MCCC) Vikings baseball team – first back-to-back trips to the National Junior College Athletic Association (NJCAA) Division II World Series, first appearance in the national championship game, first time to repeat as Region 19 champions, and a school record 80 home runs on the season. And even though the team fell short in its first championship game, the Vikings have a lot to be proud of. The Vikings' final record was 48-14, which is second in school history only to last year’s 51-10 mark. The team was undefeated in its Region 19 and Northeast District championship run, and only lost one game in the month of May going into the World Series. 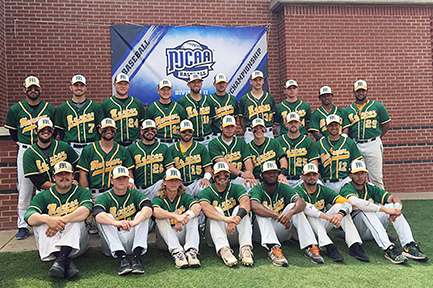 Both as a team and individually, this year’s Viking squad elevated MCCC’s baseball program's reputation among the nation’s elite. Nationally, the team ranked in the top ten in runs scored, hits, and doubles, and ranked second in home runs (80) and extra base hits (230). The team also ranked fourth in stolen bases with 142, ninth in on-base percentage (.445), and fifth in slugging percentage (.554). On the pitching side, Mercer hurlers ranked 15th nationally in earned run average at 3.42, and had the ninth lowest batting average against at .249. The offensive attack was led by Sid Kumar with his 17 home runs, the fourth highest total in the nation, and an .842 slugging percentage. 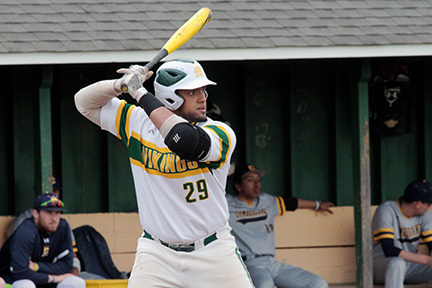 Anthony Peroni’s 60 RBI ranked him in the top 40 among all NJCAA Division II players. Other key contributors included Gabriel Castillo with a team-leading .405 batting average and 66 hits, and Danny Shane, who led the team with five triples to go along with nine doubles, three home runs, and 18 stolen bases. Key individual pitching stats for the Vikings include Dennis Brady's nation-leading 0.96 ERA. He was tied for second in wins with 11, and third in strikeouts with 118. Teammates Andrew DiPiazza and Mike Novello were also in the top 30 for win totals, with Nick Snyder and DiPiazza in the top 20 for strikeouts. Reliever Sean O’Boyle was also among the national leaders in saves. “Our coaches have done a great job of expanding our recruiting and bringing in not only talented players, but players who will continue to represent us well,” Kerins said. For their efforts, Mercer players have received numerous post-season accolades. Brady was named Region 19 Pitcher of the Year, with six of his teammates joining him on the All-Region 19 team: Anthony Boselli, Kumar and Castillo earned First Team All-Region Honors along with Peroni, who was named Region 19 Player of the Year. DiPiazza and Osvaldo Millet earned Second Team All-Region 19 Honors. All seven were also named to the All Garden State Athletic Conference teams. Brady was also named the World Series Pitcher of the Tournament, with Castillo and Kumar joining him on the All-Tournament Team. More than half of this year’s players are sophomores with many having already committed to four-year schools, while others are getting attention from Major League Baseball scouts. Even though some key players will be moving on, Kerins said a strong freshman class will be coming in next year and he looks forward to a third consecutive return to the national tournament. Kerins was assisted by coaches Fred Carella, Sean Reindel, Matt Weckerle, and Matt Zagari.